Two Princeton University studies are opening important new windows into understanding an untreatable group of common genetic disorders known as RASopathies that are characterized by distinct facial features, developmental delays, cognitive impairment and heart problems. The findings could help point the way toward personalized precision therapies for these conditions. Although not widely known, RASopathies are among the most common genetic disorders, affecting approximately one child out of 1,000. RASopathies are caused by mutations within the RAS pathway, a biochemical system cells use to transmit information from their exterior to their interior. "Human development is very complex and it's amazing that it goes right so often. However, there are certain cases where it does not, as with RASopathies," said Granton Jindal, co-lead author of the two studies. Both Jindal and the other co-lead author, Yogesh Goyal, are graduate students in the Department of Chemical and Biological Engineering and the Lewis-Sigler Institute for Integrative Genomics (LSI). Jindal and Goyal do their thesis research in the lab of Stanislav Shvartsman, professor of chemical and biological engineering and LSI. "Our new studies are helping to explain the mechanisms underlying these disorders," Jindal said. These studies were published this year, one in the Proceedings of the National Academy of Sciences (PNAS) and the other in Nature Genetics online. The researchers made the discoveries in zebrafish and fruit flies—animals commonly used as simplified models of human genetics and Jindal and Goyal's specialties, respectively. Due to the evolutionary similarities in the RAS pathway across diverse species, changes in this pathway would also be similar. Thus, it is likely that significant parts of findings in animals would apply to humans as well, although further research is needed to confirm this. The first paper published Jan. 3 in PNAS presented a way to rank the severity of different mutations involved in RASopathies. The researchers introduced 16 mutations one at a time in developing zebrafish embryos. As each organism developed, clear differences in the embryos' shapes became evident, revealing the strength of each mutation. 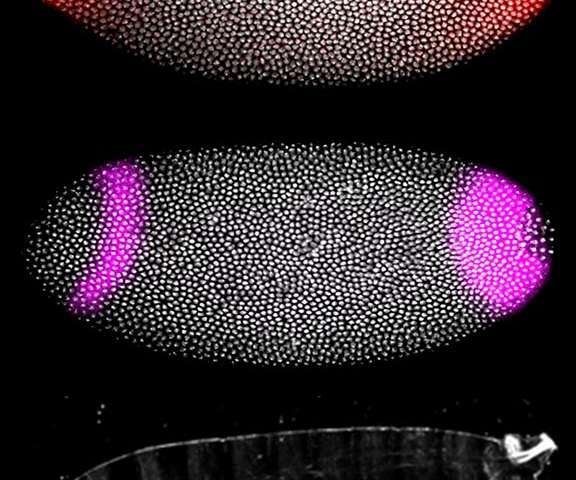 The same mutant proteins produced similarly varying degrees of defects in fruit flies. Some of the mutations the researchers tested were already known to be involved in human cancers. The researchers noted that these cancer-related mutations caused more severe deformations in the embryos, aligning with the medical community's ongoing efforts to adapt anti-cancer compounds to treat RASopathies. "Until now, there was no systematic way of comparing different mutation severities for RASopathies effectively," Goyal said. Jindal added, "This study is an important step for personalized medicine in determining a diagnosis to a first approximation." The study therefore suggested a path forward to human diagnostic advances, potentially enabling health care professionals to offer better diagnoses and inform caretakers about patients' disease progression. The study went further and examined the use of an experimental cancer-fighting drug being investigated as a possible way to treat RASopathies. The researchers demonstrated that the amount of medication necessary to correct the developmental defects in the zebrafish embryos corresponded with the mutation's severity—more severe mutations required higher dosages. The more recent paper, published online by Nature Genetics Feb. 6, reports an unexpected twist in treatment approach to some RASopathies. Like all cellular pathways, the RAS pathway is a series of molecular interactions that changes a cell's condition. Conventional wisdom has held that RASopathies are triggered by overactive RAS pathways, which a biologist would call excessive signaling. The Nature Genetics study, however, found that some RASopathies could result from insufficient signaling along the RAS pathway in certain regions of the body. This means that drugs intended to treat RASopathies by tamping down RAS pathway signaling might actually make certain defects worse. "To our knowledge, our study is the first to find lower signaling levels that correspond to a RASopathy disease," Goyal said. "Drugs under development are primarily RAS-pathway inhibitors aimed at reducing the higher activity, so maybe we need to design drugs that only target specific affected tissues, or investigate alternative, novel treatment options." The Nature Genetics study also found that RAS pathway mutations cause defects by changing the timing and specific locations of embryonic development. For example, in normal fruit fly cells, the RAS pathway only turns on when certain natural cues are received from outside the cell. 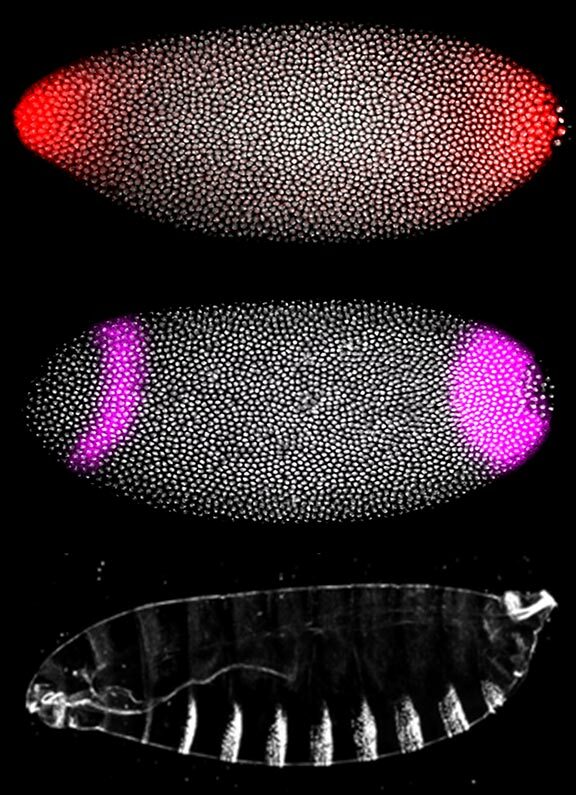 In the mutant cells, however, the RAS pathway in certain parts of fly embryo abnormally activated before these cues were received. This early activation disturbed the delicate process of embryonic development. The researchers found similar behavior in zebrafish cells. "Our integrative approach has allowed us to make enormous progress in understanding RASopathies, some of which have just been identified in the last couple of decades," Shvartsman said. "With continued steps forward in both basic and applied science, as we've shown with our new publications, we hope to develop new ideas for understanding and treatment of a large class of developmental defects." Princeton co-authors of the two papers include Trudi Schüpbach, the Henry Fairfield Osborn Professor of Biology and professor of molecular biology, and Rebecca Burdine, an associate professor of molecular biology, as well as co-advisers to Goyal and Jindal; Alan Futran, a former graduate student in the Department of Chemical and Biological Engineering and LSI; graduate student Eyan Yeung of the Department of Molecular Biology and LSI; José Pelliccia, a graduate student in the Department of Molecular Biology; seniors in molecular biology Iason Kountouridis and Kei Yamaya; and Courtney Balgobin Class of 2015. Bruce Gelb, a pediatric cardiologist specializing in cardiovascular genetics and the director of the Mindich Child Health and Development Institute at the Mount Sinai School of Medicine in New York, described the two new studies as "wonderful" in advancing the understanding of altered biology in RASopathies and developing a framework for comparing mutation strengths, bringing effective treatments significantly closer. "At this time, most of the issues that arise from the RASopathies are either addressed symptomatically or cannot be addressed," Gelb said. "The work [these researchers] are undertaking could lead to true therapies for the underlying problem."